When will the Sun shine on Sunshine? My four story apartment building is about 15 feet from a nearly identical four story apartment building to the south. I live on the third floor, and my apartment windows face south into the space between the buildings. Today at midday I can see the sun shining fully on the windows of the fourth floor apartment above mine, with the shadow from the other building starting just below their windows. How many days until it starts shining into my apartment and onto my cat? Sunshine, the cat in question. I thought I'd have to solve this mathematically (I am definitely interested in re-learning the math/science) but it turns out I can answer it socially. According to my faceboobs post last year on this exact topic, I first noticed the sun light on February 23, so the answer is sometime just before then, in about one week. I think I'm doing something wrong, as I get around May 21 — so that means that Sunshine will only get about two months of full sunshine/recharging. 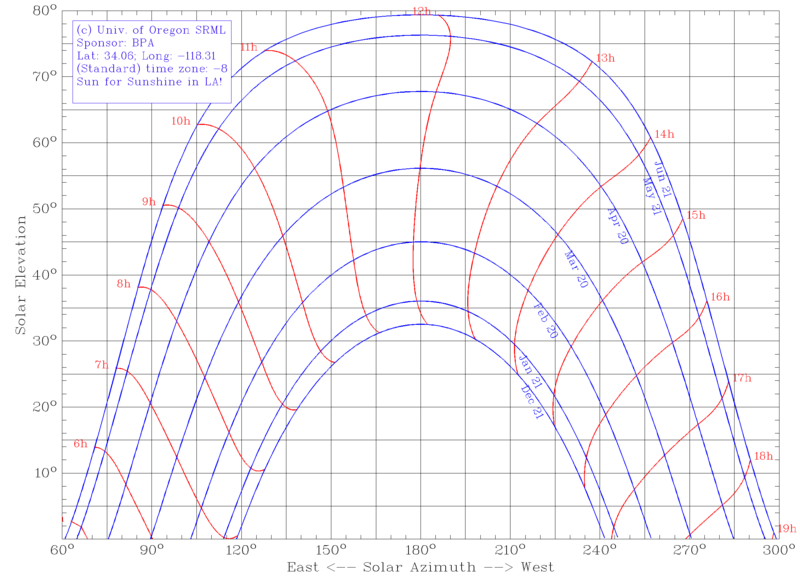 I made a sun path chart for your location (here) that shows that the current maximum solar elevation is about 44°. If your floor is 10' lower the the upper floor, and there's 15' between the buildings, the sun has to get higher by tan¯¹(10/15) degrees, or 33.7°, for Sunshine to be happy. That puts the illumination elevation at 77.7°, which when you go back to the chart, happens around May 21. The kitteh illumination will go through solstice and for about another month after. The math looks good but the initial numbers are probably off. There must be more space between the buildings. That would give you the difference between a sunlight elevation of 0 ft (defining that to be the top of the roof) and -10 feet, but not between, for example, -10 feet and -20 feet, because tan¯¹ is not a linear function. If the top of carsonb's window is X feet below the bottom of the window above, and the estimate of distance between buildings of 15 feet is accurate, the solar elevation you'd need would be tan¯¹(tan(44°) + X/15). And even for X=10 that's 58.5°, not 77.7°. fair enough, DevilsAdvocate; I thought there was something with my reckoning.